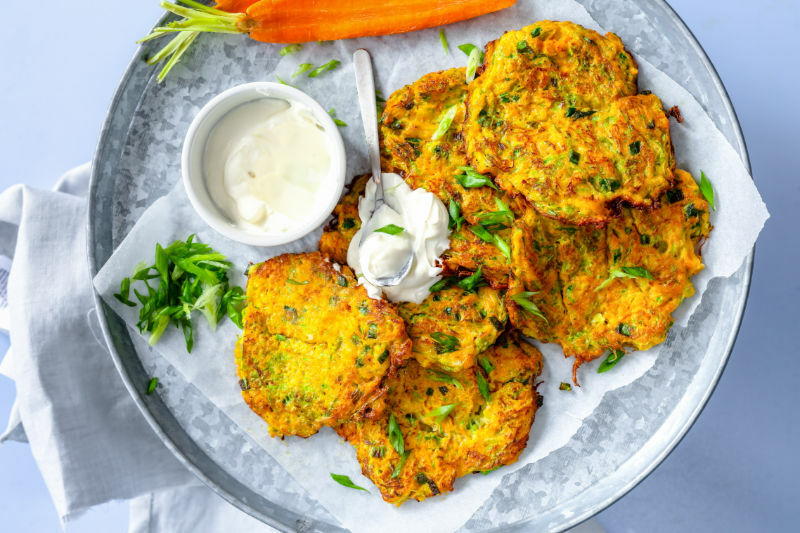 While grilled zucchini and zucchini fries are both delicious, we think the best way to eat zucchini is by creating this zucchini fritters. This recipe uses zucchini and carrots paired with ingredients like garlic, parmesan, and scallions to create a scrumptious combination that even kids will enjoy. The key to getting crispy zucchini fritters is to make sure you let your shredded zucchini drain for at least 10 minutes. Zucchinis have a lot of water content and if you don’t drain them first, then they’ll eventually make your zucchini fritters really soggy when they cook. The zucchini fritters only need to be cooked for a couple of minutes on each side until they’re golden and crisp. That makes them an easy side dish to whip up even when you’re making a quick, weeknight dinner. Shred the zucchini and place in a colander with a sprinkle of salt. Allow the shredded zucchini to rest in the colander and drain for 10 minutes then use a paper towel to press down on the zucchini and try to absorb as much liquid as you can. Transfer the drained zucchini to a large bowl. Add the carrots, garlic, flour, eggs, scallions, salt, and pepper. Stir everything together to combine. Heat a grill pan over medium-high heat and brush with olive oil. Scoop a chunk of the zucchini mixture with something like an ice cream scooper or extra large spoon and use your hands to gently shape into a compact mound. Place this on the grill pan and carefully use a spatula to press down on the mound to flatten it out. Grill the fritters for 2 to 3 minutes before carefully flipping them onto the other side and cooking for another minute or so until golden and crisp. When the fritters are done, transfer them to a paper towel-lined plate and sprinkle with a little salt and pepper. Serve the fritters warm with a dollop of Greek yogurt on each.